To pen this review, I borrowed the book from my local public library. In 1930, when other girls are content to play with dolls, Betty June Skelton played with her metal plane. And so begins this engaging picture book biography about a woman who dared to dream high and became the first lady of firsts. Betty June grew up in Pensacola, Florida when airplanes were still new. She lived near a giant navy base, so on Sundays her parents drove her to the base to see the navy planes up close. Precocious and persistent, Betty June received her pilot license at age sixteen. She even made the newspapers. Back matter includes fun facts, Betty quotes (Aerobats are murder on one’s hairdo), time line, and a selected bibliography. 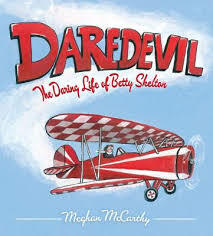 To learn more about Betty Skelton, visit the author's web page. You can watch a short film of Betty flying a stunt plane or listen to an interview recorded in 1999.